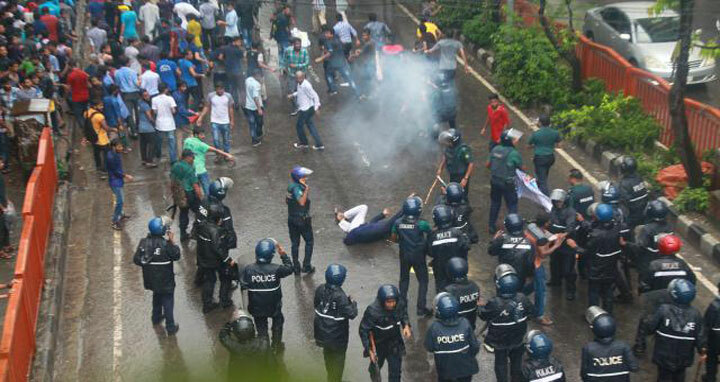 Dhaka, July 20, Abnews: Police have dispersed students of seven government colleges affiliated with Dhaka University from Shahbag on Thursday noon. The students of honors brought out a procession at Shahbagdemanding announcement of dates and schedule for their exams. The angry students have taken position near Bata Signal at Elephant Road while a Dhaka Metropolitan Police team has reached the location to control the situation. “We are trying to calm the agitating students and control the situation,” said Sajjad Ibne Raihan, senior assistant superintendent of police of New Market Police Station. Protesters demanded that 11 were arrested and 3 injured. No examinations in honors were held after bringing these colleges under Dhaka University. The affiliated colleges are - Dhaka College, Eden Mohila College, Government Shaheed Suhrawardi College, Kabi Nazrul Government College, Begum Badrunnesa Govt. Women College, Mirpur Government Bangla College and Government Titumir College.